Gennaro Gattuso believes AC Milan did not miss an opportunity by drawing 0-0 with Torino, although they would have moved to within a point of Inter with a win. Gianluigi Donnarumma made a magnificent early save to deny Torino an opener at San Siro, but it was Patrick Cutrone who could have won it for Milan late on, only to fire wide from close range. 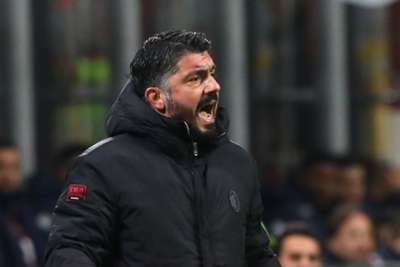 Milan would have moved to within a point of third-placed Inter with a win, but Gattuso – who has had a raft of injuries to contend with – insists the point is a positive. "I don't consider it a missed opportunity," Gattuso told Sky Sport Italia. "We were well aware that Torino are a difficult team, who are unbeaten on their travels. "We struggled a little for 15-20 minutes, but then played the game we needed to. "Torino have a lot of quality and it's a good point. I don't see it as a bad performance at all. I am sure that a year ago, we would've lost this game." One player who did return for Sunday's encounter was Gonzalo Higuain, but the striker – who missed the last two Serie A fixtures through suspension – was largely anonymous. Gattuso, though, defended the Argentinian's performance, adding that Higuain is still struggling with an injury. "Higuain is a little below par because he still has this back problem," Gattuso said. "He's playing through the pain and we need to wait for him to get better. He struggles to train consistently. "At this moment, the team is giving its all, we have a lot of players out injured and I think we're doing well in the circumstances. "I have to make do with what I've got. We have injuries, there are problems with UEFA, but all that is not my business. "I can't sit here complaining about things I can't control."